Elbsandsteingebirge & Similar Areas . . . Technique, Difficulty, Ethics . 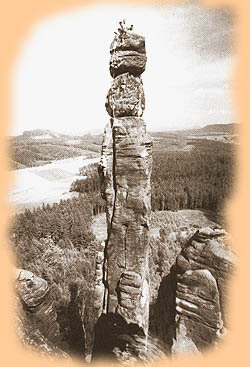 . .
Photo Walter Hahn During the first few years of the twentieth century technique advanced rapidly in the Elbsandsteingebirge, as did ethical and even aesthetic considerations. 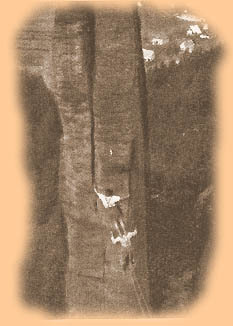 The concept of "Great Lines" was proposed by Rudolf Fehrmann : the most beautiful line was one that ascended directly, over considerable difficulties. Some of the routes thus designed were very risky, as well as fatiguing and technically demanding. 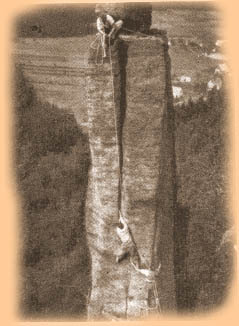 During this period climbers began to move out onto the steep faces, away from the relative comfort of cracks and chimneys, and contend with marginal, down-sloping holds and great exposure - leading Fehrmann to define: "The ultimate objective of friction climbing as the art of overcoming steeply inclined steps and holds which are not sharply edged (i.e., rounded downwards) and this also at great height, with poor or limited possibility of belaying." 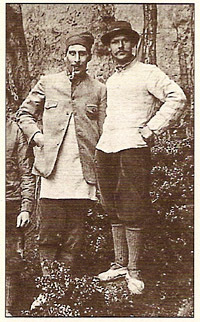 Rudolf Fehrmann was probably the equal of his American partner. "Fehrmann was a wonderful climber and much of Perry-Smith's success was due to his inspiration and guidance. 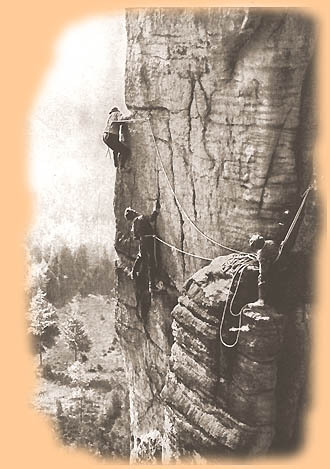 Fehrmann realized early that, in order to preserve climbing in Saxon Switzerland unspoiled, the use of artificial aid had to be prevented. 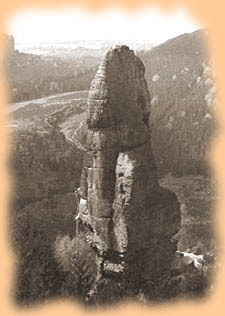 He was the brain and leader of the early climbers and was able to convince them by lectures and writing that once strict rules were broken there would be no end to it, and the beautiful towers and pinnacles would lose much of their natural charm and challenge"
Dr. Rudolf Fehrmann was an attorney. 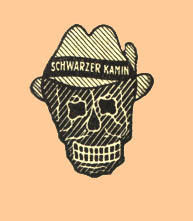 Unfortunately, he fell under the spell of the National Socialist Party and became an early member of that organization. 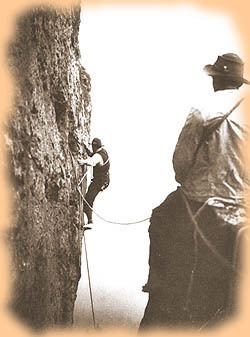 He did manage, in the 1930s, to use his Party influence to remove unnecessary restrictions to climbing in the Elbsandstein area. He served as a military judge during World War II, and was captured and sent to an internment camp in East Germany (Camp Five-Oaks near Brandenburg), where he died of "natural causes" - awaiting trial as a suspected war criminal - in March of 1948, at the age of 63. 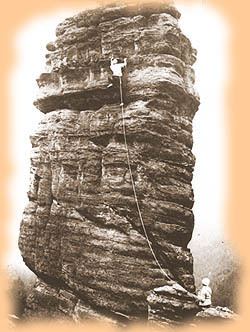 Thorington speaks of climbing practices in Elbsandsteingebirge prevailing from the early 1900s through the first half of the century: "Considering the great difficulty and exposure, very few safety rings are used. Only a leader of a new climb has the right to place a ring, and it stays as a permanent fixture . . . it is considered bad form to employ many rings . . . Regular alpine pitons are not suitable for the soft sandstone . . . holes are drilled, usually 5 or 6 inches deep, with a crown chisel about 14 mm in diameter, and then the shaft of the ring is driven in together with wood or lead pieces to make it fit solidly. . . The rings are meant only for belays . . ."
Artificial Aid - or Not ? Although the levels of difficulty were considered quite high, and ethical standards quite rigorous, a somewhat different attitude existed concerning artificial aid. 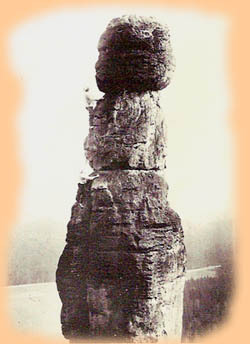 Pounding something into the rock and putting weight on it was not condoned, but a philosophical attitude of "two bodies, one climber" was acceptable. 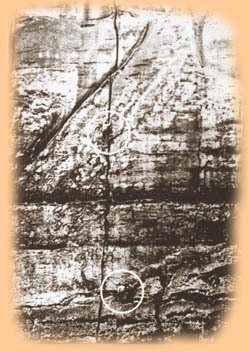 Perry-Smith himself describes the ethical envelope - on the first ascent of what Perry-Smith calls the Drilling Needle [Haupt-Drilling] on October 11, 1908 - and, in addition, gives us an understanding of the level and severity of competition existing in the region: "Hoyer stood beside the smooth groove, Hünig on his shoulder, while from the side I shoved Hünig higher and finally held him on my hand until he secured a hold and could overcome the difficult spot. . . . After a traverse to the right and 5 meters upward, Hünig advanced and climbed on my arm. . . . below the top he met difficulty . . . he shot down, fell on my back, then through the air. His rear end struck the rock with a bang and blood streamed from his head like a cloudburst, reddening the stone. He soon sat up on the ledge and cursed God and the world in general . . . it seemed my duty to advance, particularly since there were observors below, some carrying the black flag with death's head of the Schwarzer Kamin [the Dresden club of which the party were members]. In another incident, Perry-Smith writes in a letter of his climb of the summit block of the Jungfrau in the Alps: ". . . We stood together in small footsteps with smooth rock in front and nothing at all for the fingers to hold. 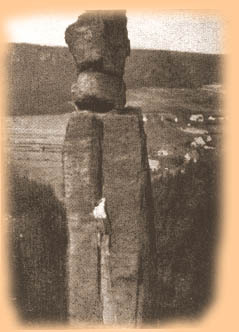 The summit was gained by shoving Hünig over the smooth rocks until he could grasp the top with his fingers." 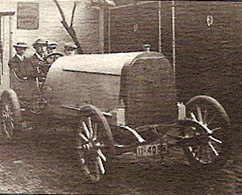 In fact, after a two hour effort to drive in safety-rings, "Hünig climbed on Perry-Smith's knee, then on his shoulder, but still could not reach the top scarcely a meter away. Only when Perry-Smith raised him with out-stretched arm could he grasp the peak . . ." (Thorington). A Spectacular Pinnacle Climbed by the Perry-Smith/Fehrmann Team . . .
Back in the USA . . .
Perry-Smith & Buildering . . .
Perry-Smith returned to Philadelphia for a year or so, before leaving again for Dresden in August of 1905. 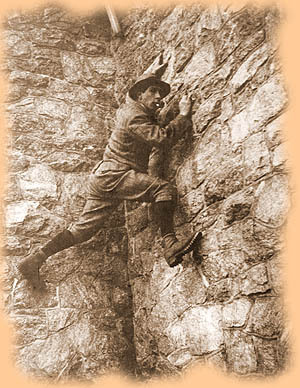 In America, he practiced climbing on the stone walls of a house and also ascended the exterior of office buildings - before being shooed off by police for causing traffic jams. A friend called him a "human fly".